Hardbook special for February: reg. $29.99, now $19.99!!! Beautiful and clear account of Genesis Chapters One through Eight and how these events affect us to this very day. Hear the history of Lucifer's fall from Heaven, the creation of the world, Adam and Eve, Cain and Abel, and Noah from the perspective of the great love the Creator has always had for mankind and the great appreciation that is due Him in return. this book helped me so much with learning to count my blessings! That by being appreciative all the time I experienced staying focused on the positive I was not pulled down by negative! Very powerful! This book was life-changing!! It opened my eyes to a whole new perspective on life. I had never really thought about how God's rules are actually safety barriers, protecting us from the natural consequences of trying to live off our own power instead of God's DIVINE power, which is the only power that can truly sustain life. Looking at life from this perspective has made everything SO much more enjoyable. I can face every situation in life, even the toughest of situations, and make it through with peace, knowing that God is there and guiding me through it, if I am letting Him guide my actions and thoughts. I don't know where I would be if not for His protection, and for this book showing me how to stay inside His heavenly protection!!! from Williamsburg You HAVE to read about Spiritual Warfare Through the Eyes of Genesis! This book is a work of art!!!! Only God can give such an interesting, applicable, ever deepening view of the lies that have been heard by humans over all the ages. Gwen Shamblin has faithfully written words that will unlock Spiritual Warfare, and make it make sense---and most of all give you the gameplan of the enemy---so that you can WIN your battles. This masterpiece is a TREASURE in my home. I personally refer to it often, next to the bible, I feel its the most valuable book I own. Please also, pair your journey through this book with the workbook!!! This book amazed me as it revealed the age old lie..."poor you" "victim lie" from in the garden ....is still the same lie the devil uses in the 21century...life revealing and forever changing truth!! from Illinois I read it over & over! 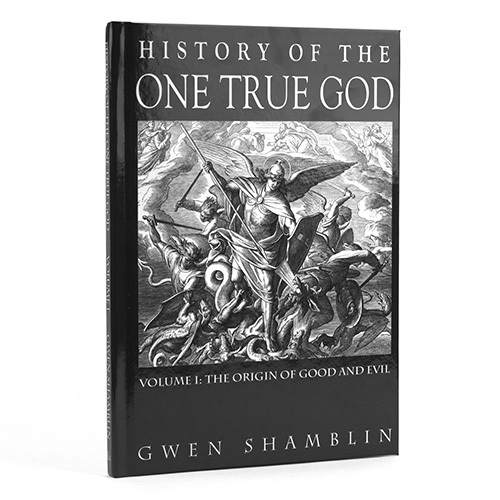 If I could have a favorite book by Gwen Shamblin ( they are all my favorites), it would have to be this one, "History of the One True God." It helps me put life into perspective and focus on what really matters. It makes love God more every time I read it! Love it!